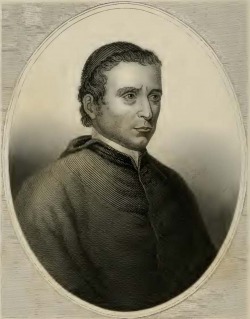 Joseph Caspar Mezzofanti (1774-1849) was an Italian Cardinal who (specific estimates vary, historians generally agree) spoke around 38 languages and 50 dialects fluently, and spoke many other languages with less fluency. He never left Italy and yet managed to learn how to speak languages without accent. People from all over the world came to challenge him in their native tongue. They all reported their amazement at this man's fluency. With this amazing ability in language learning, Mezzofanti holds the world record for multi-lingual fluency, and is considered the greatest polyglot in history. He was the son of a poor carpenter of Bologna. As a grade-school student in Bologna, young Mezzofanti learned Latin, Ancient Greek, Spanish, German, and Central & South American indigenous languages from former Jesuit missionaries. To his great love of study he added a prodigious memory, so that at the age of twelve years he was able to begin the three years course of philosophy, which he closed with a public disputation. His theological studies were completed with no less distinction, at an age at which he could not yet be ordained; consequently he devoted himself to the study of Oriental languages; and in 1797 he was appointed to the chair of Hebrew at the University of Bologna, and ordained a priest. When the Cisalpine Republic was established, he refused to take the oath of allegiance to it, lost his chair at the university, and was compelled to give private lessons in order to support himself. After the battles of 1799 and of 1800, the hospitals of Bologna were crowded with wounded and sick of almost all the nationalities of Europe, and Mezzofanti in giving religious assistance to the unfortunate seized the opportunity of perfecting his knowledge of the languages which he had already studied, as well as of learning new ones. In 1803 he was appointed assistant in the library of the Institute, and later, professor of Hebrew and of Greek at the university, which relieved him financially. In 1806, he refused an invitation of Napoleon to establish himself at Paris. In 1808, the chair of Oriental languages was suppressed, and Mezzofanti received, in compensation, a pension of 1000 lire; but, in 1815, he became librarian of the university, and occupied his chair once more. In 1814 Pius VII's requested Mezzofanti to remain at Rome and place his learning directly at the service of the Holy See, an invitation which the modest priest, this time, accepted, after long resistance; soon he received the title of Domestic Prelate, and a canonry at Santa Maria Maggiore, which was changed, later, for one at St. Peter's. At Rome, also, he took advantage of opportunities to practice the languages that he had acquired, and to master new ones. In order to learn Chinese he went to the Capodimonte college for foreign missions, at Naples. In 1833, he was named Custodian-in-Chief of the Vatican Library, and Consultor of the Congregation for the correction of the Liturgical Books of Oriental Rites, of which he became Prefect. On 12 February, 1838, he was created cardinal under the title of St. Onofrio al Gianicolo; he was also a member of the congregations of the Propaganda, of Rites, of the Index, and of the Examination of Bishops. The events of 1848 undermined his already enfeebled health, and a combination of pneumonia and gastric fever put an end to his life. He was buried without pomp in a modest tomb of his titular church, over which a monument was raised in 1885.